Some thought should be given to how certain characteristics of coverage in the print media can affect the people concerned. For example, although the articles analyzed generally showed consideration for the bereaved, the desire to assign a motive or to explain an intrafamilial homicide led to an incursion into the privacy of the victims and their families. However, revealing intimate details about a person’s family or married life does not always lead to a better understanding of a homicide. The articles analyzed also devoted considerable attention to the revelations and reactions of neighbours, members of the community and even strangers, thus often providing little in the way of verified factual information about the cases they discussed. In addition, several of the actors concerned by media coverage of intrafamilial homicides stressed the importance of achieving a balance in the way the facts are reported. For instance, they said that coverage should not focus exclusively on positive comments made about the homicidal parent, but should instead put these remarks into their proper perspective by highlighting the criminal nature of the act committed and taking care not to glorify the perpetrator of the homicide. As in the case of suicide, there is good reason to ask whether it is necessary to provide a detailed, vivid and explicit description of the method used to commit a homicide or suicide. There is also a need to reflect on the impact such descriptions can have on the loved ones of the victims or the perpetrator. 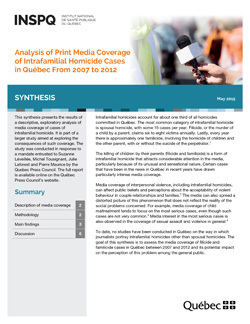 In general, media coverage of filicides and familicides committed in Québec gives an overall impression that there is not simply one motive for these homicides. That being said, when the articles were considered individually, it was noted that they sometimes simplified the “reason” why the perpetrator committed the filicide or presented the homicide as a way out of the perpetrator’s problems. A recent separation and disputes over child custody are often presented in the media as a “classic scenario” for explaining intrafamilial homicide when, in reality, they are simply some of the factors that can be associated with these events. Other factors include, in particular, spousal violence, child maltreatment, and severe distress or depression on the part of the perpetrator. Intrafamilial homicides are rarely discussed within the broader context in which they occur. Describing intrafamilial homicide as the outcome of a difficult separation or the way out of disputes over child custody for parents who love their children does not help to denormalize such acts. Every year, thousands of families find themselves in similar situations without resorting to homicide. Repeating this reality more often and focusing the discussion on the consequences of homicide on families and society as a whole, not to mention available support resources, would help to provide the public with less anecdotal information and to stress the uncommon or unusual nature of intrafamilial homicides. Lastly, even though few studies have focused to date on how media coverage of intrafamilial homicides may encourage people to commit such acts, the precautionary principle suggests that care must be taken. This becomes particularly obvious when work on media coverage of suicide is taken into account. Such work has shown that the way in which suicides are reported in the media can play a role in cases of suicide “by imitation” and that it is possible to raise media awareness about this issue and thus encourage the adoption of good practices. Therefore, it is important to continue reflecting on the way in which intrafamilial homicides are reported and portrayed in the media, as well as on the impact such media coverage can have on the victims’ loved ones, the community and society in general.